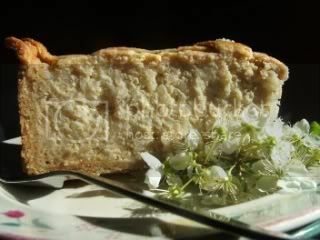 A reader wrote to me a couple of weeks ago: "Do you have any vegan recipes for the Italian wheat and rice pies that are served on Easter morning along with the frittata that my Grandma used to make? Thank you, Adrienne"
I did some research on the pie, and then decided to try the formula I came up with on some friends who were coming for dinner for St. Patrick's Day! I thought it turned out rather well, impressive looking,and we all loved it, but, since I had never actually eaten the "real thing", I had nothing to compare it to! So, I asked Adrienne to try it ahead of time, for her sake and mine-- maybe just half the recipe, which she did-- and give me an honest assessment. Her verdict? "Out of this world great." 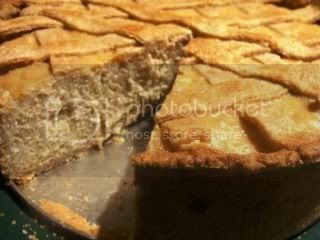 This pie is traditional in Southern Italy. Adrienne's mother's parents came from two different parts of Italy, Calabria and Puglia, but their foods were nearly identical, she told me. I made the pie with rice, but it is also sometimes made with pearl barley or even the small pasta called orzo instead of rice. If you use orzo, you can cook it the same way as the rice, using 2 1/2 cups of nondairy milk instead of 2. If you use pearl barley, soak the the grain in cold water to cover for 24 hours, then drain and cook in the milk as for the rice. 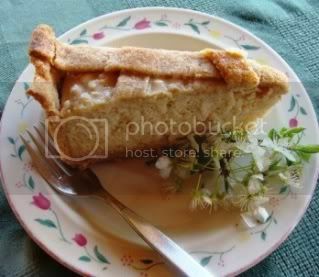 This pie is also sometimes made with wheat kernels, which I suspect was the original version, since wheat and wheat breads are still powerful symbols of spring rebirth in Italy, harkening back to ancient times. I see no reason why it could not be made with spelt or kamut kernels or brown rice instead, but I have to try this out before giving you the directions! The whole grain for this pie is usually soaked for 3 days, changing the water each day, and then drained well and cooked in milk, but I can't say for how long or in how much milk until I try it. I could also probably work out a soy-free version made with my "almond ricotta" from Nonna's Italian Kitchen, if necessary, but I'll have to experiment with that at another time. 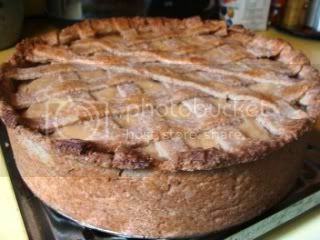 It's a spectacular looking pie, and will feed alot of people! I think it would be great served with fresh strawberries. You can cut this recipe in half for a smaller gathering! For a gluten-free pie, use rice as in the recipe and, for a gluten-free pastry, use 2 3/4 cups plus 1 1/2 tablespoons of my High-Fiber, Gluten-Free Flour Mix instead of all of the flour. The recipe for the Mix is at my friend Brenda's website. The seasoning, of course, is a matter of taste. You may like more cinnamon, less orange rind, etc. -- it's up to you! Mix the Dry Mixture ingredients in a medium bowl. In a smaller bowl, whisk the soy or almond milk with the lemon juice, and then whisk in the oil and flavorings until the mixture is emulsified. 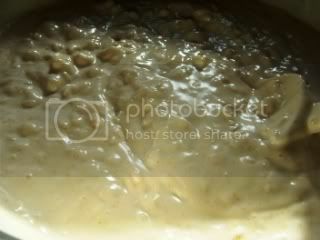 Quickly stir this Wet Mixture into the dry ingredients and mix briefly, forming the pastry into a ball. If it's too dry, add cold water just a few drops at a time until it holds together. Don't over mix or the pastry will be tough. If you are make one large pie make a ball with 2/3's of the dough and another ball with the last 3rd. If you are making 2 smaller pies, divide the dough into 4 equal pieces and roll into balls. Place in plastic bags and refrigerate until ready to roll out. Bring the creamer and milk to a boil in a heavy medium saucepan. Stir in the rice, sugar, vanilla and salt, turn down the heat to Low, cover tightly and cook for 35 minutes, or until all of the liquid is absorbed. Scoop the rice out into a shallow bowl to cool. 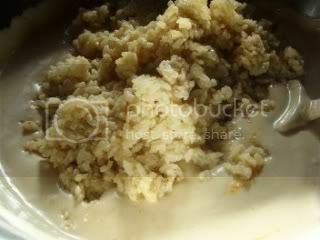 If the rice looks very dry, stir in a few tablespoons of non-dairy milk, but don't make it runny. Place ALL of the "Ricotta" Mixture ingredients (except the optional candied orange peel) into a large blender, Vita-Mix or food processor and blend until very smooth. 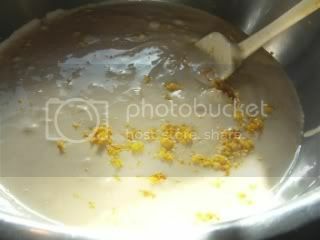 Scoop the smooth mixture into a mixing bowl. 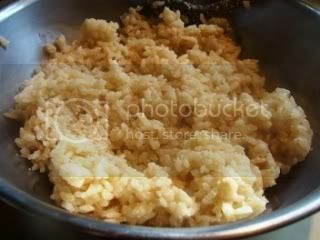 Add the cooled, cooked rice mixture and the optional candied peel, if using, and fold and stir until evenly distributed. Set aside. Heat the oven to 350° F for the large pie or 375° F for the smaller pies. roll the largest ball of dough out on a piece of baking parchment (you shouldn't need any flour to roll this out on parchment) to make a circle 15" across (diameter). Carefully and loosely roll this around the rolling pan and gently unroll over the top of the prepared springform pan. Gently ease the pastry down into the pan and secure it in place by pinching the excess dough to the top edges of the pan. Make sure that any cracks or tears are smoothed out and covered (use extra bits of dough, if necessary), and that the dough fits neatly into the pan. roll two of the equal-sized balls to fit 9 or 10" pie dishes (with enough dough to overlap the rims of the pie dishes) and ease them into the dishes, gently fitting them into the pans and smoothing out any cracks. 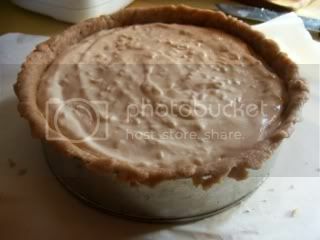 (There will be scraps of dough left over to fillout the rim of the crist, make patches, etc.). 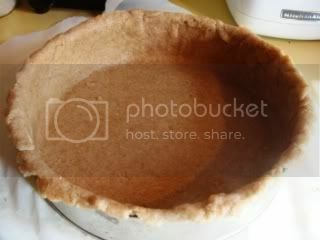 Scoop the filling into the pie crust(s) (1 large or 2 smaller) and smooth the top(s). It should come up just about to the top of the pan(s). Roll out the remaining dough as if you were making a top crist for the springform pan or two top crusts for the pie dishes. Cut the rolled-out dough into 1/2"-wide strips, using a pizza cutter (or a ravioli cutter for a scalloped edge). or the video instructions here . Press the ends of the strips into the dough at the rim of the pans to make sure they adhere. With the large springform pan, cut the edge of the dough off carefully with a sharp knife on the OUTSIDE of the rim of the pan so that the dough sticks to the slim out edge of the pan. With the smaller pie pans, flute the edge of the crust as you ordinarily would, making it look pretty, then cut the rough edges off the out edge of the pie with a sharp knife. Gently brush the lattice with soy or nut milk, using a fine pastry brush. 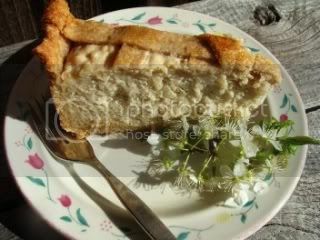 If you like, use scraps of dough to make leaf or flower shapes to decorate the top of the lattice pastry. 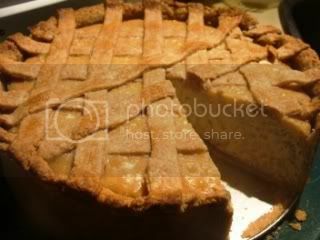 Bake the large pie for 1 1/2 hours at 350° F.
Bake the smaller pies for 45 minutes at 375° F. Either way, a toopick or bamboo skewer should come out clean when inserted in the middle of the pie. Cool the pie(s) thoroughly on racks (takes several hours), then refrigerate until serving time. Decorate the pies with flowers for serving, of you like. I think some fresh fruit, such as stawberries, makes a good accompaniment. Nutrition (per serving): 280.8 calories; 18% calories from fat; 6.0g total fat; 0.0mg cholesterol; 130.0mg sodium; 190.4mg potassium; 46.8g carbohydrates; 1.1g fiber; 22.2g sugar; 45.7g net carbs; 10.0g protein; 5.9 points. BRAVA, BRAVA on an absolutely WONDERFUL vegan rice pie recipe!!!!!! I will be making this pie as a new Easter tradition for years to come!!! Thank you for writing, Lainey! I'm so happy that you and your family enjoyed it.